What is the Big Idea (Friday)? Over the last few years I evolved a tradition in my class called Big Idea Friday. It started out from my own learning where I try to write a weekly blog post about something that I’ve been thinking about in my teaching practice. I found the process for processing the end of a busy week of teaching and refocusing my mind towards the week ahead. The tradition also kept me writing when I really wanted to give up blogging (though I’ll be the first to admit my reflections have been rather sparse of late). As I was going through the process of reflecting each week I started tagging my reflections using the New Zealand Registered Teacher Criteria (RTC) – a set of standards which New Zealand teachers are judged against during our professional appraisal process. Using the RTC gave my reflections a conceptual framework on which I could hang my ideas on teaching and learning. Tagging the posts was a way I could easily document shifts in my thinking and teaching practice over time. The practice slowly but surely started seeping into my classroom. Over the week I’d watch the kids and think about conversations I’ve had with them. Quite often a picture or video from my twitter feed would show up that I could use as a provocation in class to get the kids reflecting on what I’ve noticed and thus Big Idea Friday became a classroom tradition. If it’s been a bad week where lots of kids have made bad choices? There’s some lessons from crazy dancing guy on the power bystanders have in a group situation. In the middle of classroom projects and wanting to give up? An advertisement from Apple to remind us that nothing worth doing is easy. Want to get kids excited about the week ahead? Let’s take a look at Caine and his arcade. The crazy thing about Big Idea Friday is that I had no idea what ‘it’ was and why ‘it’ was important until I was sitting in a Kath Murdoch workshop back in May. There I learned about split screen teaching – the idea that alongside content and concepts teachers need to develop learning dispositions in children – and a little light bulb went off in my head. This wasn’t just some crazy tradition I’d stumbled upon through my own learning, someone important was giving the practice some legitimacy. As I’ve become more familiar with the PYP, I’ve started to use media as a way for us to look at the PYP attitudes and learner profile to give the process a stronger conceptual framework. The key competencies from the New Zealand curriculum also lend themselves to this type of reflection. If I had a time machine, I’d have been more explicit in making links with the kids between Big Idea Friday and the key competencies. Documenting Big Idea Friday has been easy – I post the provocation on the class blog and the kids comment on the post. Using the class blog opens up the conversation to others in particular my students’ families who have commented on their own experiences which further enriches our learning. 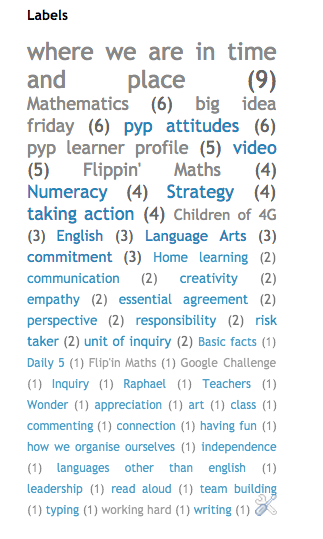 I’ve also found blogging lends itself to documenting this type learning – the messy stuff that comes out of conversations with the kids rather than a long-term planner – through the label feature which enables me to tag posts with different elements of the learner profile or pyp attitudes. Over time the labels build up a picture of the classroom conversations which then informs planning for future learning engagements. This is what my class looks like towards the end of term 1. The tag cloud will look different after after another few weeks. Tagging is a brilliant way to be able to draw out non-linear learning. We might spend a few weeks talking about creativity and not touch the topic again for a few months. If the kids were documenting their reflections in a book or a google doc it would be hard to make links. However through tagging I can quickly draw up all the posts on creativity to spot shifts in the children’s thinking over time. Tagging an idea down to a few words ensures that the concept and provocation is purposeful and relevant to the classroom conversation. Big Idea Friday might seem like the antithesis of true inquiry learning. After all isn’t reflection something we should be doing all the time? Of course. However my students and I find value in finding time to explore those dispositions that go beyond content knowledge and help the kids develop as people. More often than not, Big Idea Friday is often accompanied by that eerie feeling of the noise being spontaneously sucked out of the classroom as the kids get lost in their thoughts. Hi, are you able to share your class’s blog? Love it, Stephanie. I noticed these posts on your First 15 blog too. Very powerful. I love labels on the blog as a way to curate too. So easy.